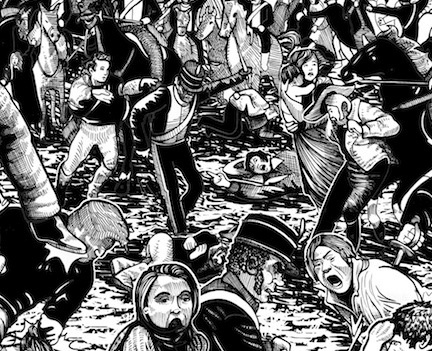 On 16 August 1819, the area around what is now St Peter's Square, Manchester, played host to an outrage against over 60,000 peaceful pro-democracy and anti-poverty protesters; an event which became known as the Peterloo Massacre. Periods of famine and chronic unemployment, exacerbated by the introduction of the corn laws, and the lack of suffrage, had all enhanced the appeal of political radicalism. In response, the Manchester Patriotic Union, a group agitating for parliamentary reform, organised the demonstration to be addressed by the well-known radical orator Henry Hunt. People came in peaceful protest—men, women and children, carrying picnics and wearing their Sunday best, but that didn’t deter local magistrates from sending in an armed cavalry to disperse the crowds and arrest the speakers. An estimated 18 people died from sabre cuts and trampling. Over 700 men, women and children were seriously injured. The massacre was named Peterloo in an ironic comparison to the Battle of Waterloo, which had taken place four years earlier. On hearing of the massacre, poet Percy Bysshe Shelley who was in Italy at the time penned The Masque of Anarchy, a powerful 91-verse epic widely regarded as the greatest political poem in British history. 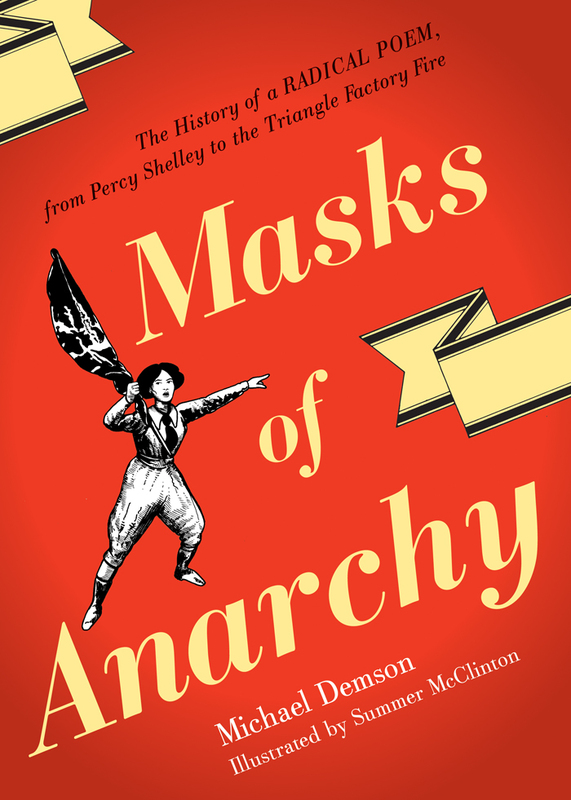 Michael Demson’s graphic novel Masks of Anarchy written in collaboration with talented illustrator Summer McClinton, and published this year by Verso, charts the extraordinary history of this poem, from its conception in Italy and suppression in England to the moment it became a catalyst for protest among New York City workers a century later. As part of the Manchester International Festival earlier this Summer, actress Maxine Peake ('Shameless', 'Silk') and director Sarah Frankcom (Artistic Director, Royal Exchange Theatre) delivered a haunting and provocative new interpretation of Shelley’s landmark work, which is as relevant to post-riot, mid-recession Britain as when it was first written. 'The Masque of Anarchy' was staged in the atmospheric Albert Hall, mere steps from the site of the massacre itself. A touchstone event in British history, the Peterloo Massacre and the outrage it spurred ultimately helped to bring about the formation of the trade union movement and the reform of parliamentary democracy.